ASUS N56 N56V N56J N56JR N56VJ N56VM N56VZ N56D. ASUS N55E N55S N55SF N75E N75S N75SF N55SL. ASUS A42 A40J A42J A42F Replace TS-L633A TS-L633C DVD. ASUS X55 X45 X44 X44h X43 X42J X53S X84. HDD Interface: Takes a 2.5" SATA HDD or SSD. ASUS G75V G75VM G75VW G75VX X58 X59. ASUS G75VX G75VX-RH71 G75VX-QH72 G75vw-ds72. The 2nd Hard Disk Drive Caddy / Adapter to bring you new maximum data storage flexibility. With the second HDD in your Laptop, you can speed to backup important applications and critical data. Hard Drive Caddy for an Asus X551M Includes screws and caddy. Internal p/n -Caddy. System Pull. Condition :System Pull. Although we do the best we can to verify compatibility,ALWAYS double check that you are purchasing the right part foryour machine. Contents: HDD Caddy. Used Tested Working Condition. Item is used and may have scuffs, scratches or signs of wear. Look at pictures for details. Item has been fully inspected and is in good condition. Pulled from a working unit. 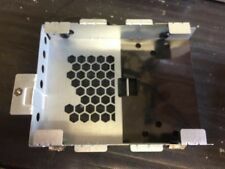 Hard Drive Caddy for an Asus Q502L p/n N542LA. Includes screws and caddy. System Pull. Condition :System Pull. Although we do the best we can to verify compatibility,ALWAYS double check that you are purchasing the right part foryour machine. Asus F553M X540S X456UQ X541U X542U X556U X555QG. 2ND Hard Disk Drive HDD caddy/adapter for any uses 9.5mm height DVD drive with SATA connector to the motherboard. It work with SATA hard drive, and SSD (Solid State Drive) as well. SATA 2ND Hard Disk Drive HDD caddy/adapter for any uses 12.7mm height DVD drive with SATA connector to the motherboard. It work with SATA Hard drive, and SSD (Solid State Drive) as well. 1 x 2nd HDD SSD Hard Drive Caddy. Universal 2.5" SATA HDD SSD Optical bay Hard Drive Caddy Adapter for ASUS K50IJ K52N K53U K55A K61IC X52F X5DI. for ASUS K50IJ K52N K53U K55A K61IC X52F X5DI;. This is Universal 12.7mm SATA to SATA 2nd Hard Drive Optical Bay Caddy Adapter, ONLY fits 12.7mm thickness SATA Connection optical drive bay. The Asus U56E Hard Drive Laptop Caddy w/Screws has been graded A. This item is 100% tested, functional, and in very good condition. Robot Vacuum Parts. Used Robot Vacuums. Fans - Cooling Fans. Hard Drive Caddys. 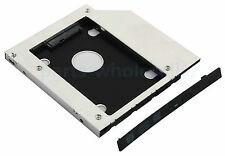 12.7mm SATA to SATA 2nd Hard Drive Caddy For Laptop Optical Bay Acer Asus Compaq Dell HP Lenovo Sony Toshiba. The 2nd Hard Disk Drive Caddy / Adapter to bring you new maximum data storage flexibility. For SALE : Genuine Asus G75V G75VW Hard Drive Caddy. Universal 2nd SATA Hard Drive HDD SSD Optical bay Caddy for Asus VivoBook S551LB S550CB S550X3317CM-SL. forAsus VivoBook S551LB S550CB S550X3317CM-SL;. Any other accessories like Mounting Bracket or ejector latch will not included. Universal 2nd HDD SSD Hard Drive Optical bay Caddy Adapter for Asus F555L N551VW N552VW-FW055T F555LD-XX110H. for Asus F555L N551VW N552VW-FW055T F555LD-XX110H ;. With the second HDD/SSD in your Laptop, You can speed to backup important applications and critical data ( Simply remove your CD-ROM drive and put the Caddy (with the added hard drive) in its place;. ). HP ENVY dv6-7246us Replace DS8A8SH DVD. SAMSUNG RV520 RV620 RV720 Replace TS-L633J TS-L633B DS8A8SH DVD. SAMSUNG np500pc4 Replace DS8A8SH DVD. SAMSUNG np300v5a-s07il np300v3a-a0bil Replace SN-208BB DS8A8SH DVD;. A455 K455 Series,example:A455LA A455LN,K455DA K455LN. X455 F455 Series,example:X455LA X455YA,F455LD F455WE. Laptop Hard Drive Cover Caddy. This Serial ATA Hard Drive Adapter lets you add a second hard drive to the laptop systems. 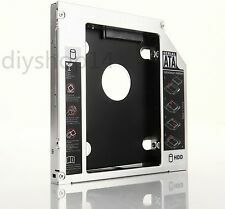 Hard Drive Caddy for an Asus X502C p/n 13NB0011M01. Includes screws and caddy. System Pull. Condition :System Pull. Although we do the best we can to verify compatibility,ALWAYS double check that you are purchasing the right part foryour machine. Universal 2.5" SATA HDD SSD Optical bay Hard Drive Caddy Adapter for Asus G751 G751J G751JT G751JY replace UJ172 UJ272 DVD. 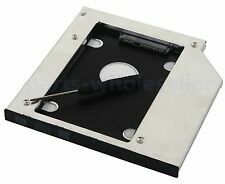 for Asus G751 G751J G751JT G751JY replace UJ172 UJ272 DVD ;. The 2nd Hard Disk Drive Caddy / Adapter to bring you new maximum data storage flexibility. Universal 2nd HDD SSD Hard Drive Optical bay Caddy Adapter for ASUS X555L X555LA X555LD X555LB K555L Q551L R554L. for ASUS X555L X555LA X555LD X555LB K555L Q551L R554L ;. With the second HDD/SSD in your Laptop, You can speed to backup important applications and critical data ( Simply remove your CD-ROM drive and put the Caddy (with the added hard drive) in its place;. ). Universal 2nd HDD SSD Hard Drive Optical bay Caddy Adapter for Asus k53e X53S K53U DS-8A5SH DVD. for Asus k53e X53S K53U DS-8A5SH DVD ;. With the second HDD/SSD in your Laptop, You can speed to backup important applications and critical data ( Simply remove your CD-ROM drive and put the Caddy (with the added hard drive) in its place;. ). ASUS G73Jh G73Jw G73Sw. The 2nd Hard Disk Drive Caddy / Adapter to bring you new maximum data storage flexibility. With the second HDD in your Laptop, you can speed to backup important applications and critical data. Asus X450JF X554L R750jv U6V-A1 GSA-U20N. Add this caddy to your laptop to give you another hard drive. This 2nd SATA Hard Drive Adapter lets you add a second hard drive to the laptop systems. 1x Hard Drive Adapter/caddy. Asus ROG GL551JW G551JW-CN049H G551JW-CN215D. Add this caddy to your laptop to give you another hard drive. This 2nd SATA Hard Drive Adapter lets you add a second hard drive to the laptop systems. 1x Hard Drive Adapter/caddy. Hard Drive Caddy for an Asus Vivobook S400C Includes screws and caddy. System Pull. Condition :System Pull. Although we do the best we can to verify compatibility,ALWAYS double check that you are purchasing the right part foryour machine. Add this caddy to your laptop to give you another hard drive. ASUS X555L X555LA Q551L R554L R510J N552VX. This 2nd SATA Hard Drive Adapter lets you add a second hard drive to the laptop systems. 1x Hard Drive Adapter/caddy. Add this caddy to your laptop to give you another hard drive. This 2nd SATA Hard Drive Adapter lets you add a second hard drive to the laptop systems. 1x Hard Drive Adapter/caddy. 4x hard drive screws. ASUS X555L X555LA X555LD X555LB K555L Q551L R554L. 2ND Hard Disk Drive HDD caddy/adapter for any uses 9.5mm height DVD drive with SATA connector to the motherboard. It work with SATA hard drive, and SSD (Solid State Drive) as well. ASUS N53S N53SV DS-8A5SH UJ8A0ASW DVD Drive. ASUS G73Jh G73Jw G73Sw. ASUS N55 N73 N43 N45 N53. The 2nd Hard Disk Drive Caddy / Adapter to bring you new maximum data storage flexibility. With the second HDD in your Laptop, you can speed to backup important applications and critical data. Asus X540L X540L-SI3020SP X751 X751LAV X751LD. Add this caddy to your laptop to give you another hard drive. This 2nd SATA Hard Drive Adapter lets you add a second hard drive to the laptop systems. This device accepts 2.5" /9.5mm SATA HDD/SSD. Hard Drive Caddy for an Asus Q503U Includes caddy and screws. System Pull. Condition :System Pull. Although we do the best we can to verify compatibility,ALWAYS double check that you are purchasing the right part foryour machine. The 2nd Hard Disk Drive Caddy/Adapter will bring you new maximum data storage flexibility. With the second HDD in your Laptop, you can speed to backup important applications and critical data. 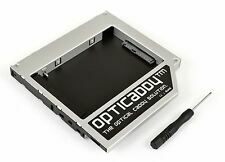 Simply remove your optical driver and put the Caddy (with the added hard drive) in its place. ASUS G550J G550JK G551JM K550JK G551JX X555QG. 2ND Hard Disk Drive HDD caddy/adapter for any uses 9.5mm height DVD drive with SATA connector to the motherboard. It work with SATA hard drive, and SSD (Solid State Drive) as well. Add this caddy to your laptop to give you another hard drive. This 2nd SATA Hard Drive Adapter lets you add a second hard drive to the laptop systems. This device accepts 2.5" /9.5mm SATA HDD/SSD. 1x Hard Drive Adapter/caddy. Asus U41sv U43jc U46e U56e UJ8A2AS dvd. Add this caddy to your laptop to give you another hard drive. This 2nd SATA Hard Drive Adapter lets you add a second hard drive to the laptop systems. 1x Hard Drive Adapter/caddy. ASUS R510 R510CC R510VC R513 DA8A5SH DA-8A5SH. Add this caddy to your laptop to give you another hard drive. This 2nd SATA Hard Drive Adapter lets you add a second hard drive to the laptop systems. 1x Hard Drive Adapter/caddy.